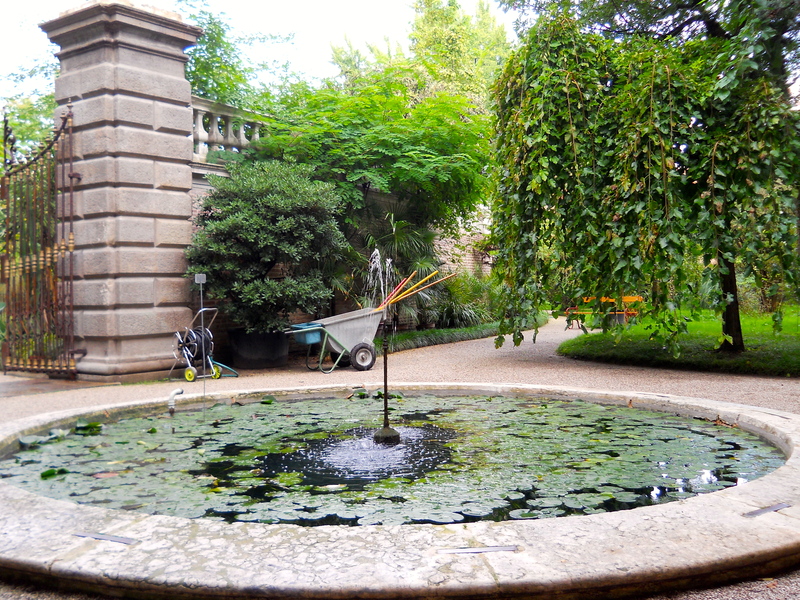 The Botanical Garden in Padua is all about the number 4 – four quarters, four fountains, four gates, four compass points, four seasons. This patterning gives the garden a sense of stability, a solidity close to the earth. Strong physical groundedness is matched with a pleasing intellectual rhythm, an orientation in both time and space. There is the feeling of being located within a wider order, reminded of the four elements, the four winds, the four humours, the four phases of the moon – Renaissance ideas of harmony, the music of the spheres. In a place so thoroughly governed by the number four, things make sense: it feels comfortable, secure, natural. Even though, of course, it is all man-made. But the men who made it (and in 1545 it would have been men), designed and dug and planted it, were looking at and listening to the world as if they’d just been born, asking questions, alive to their close connection to the land, the universe and their dance within it. 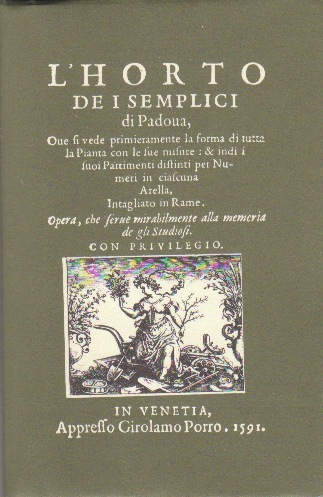 Vice-Prefect Antonella Molla gave me a book, a facsimile of L’Horto de i Semplici, published in Venice in 1591. After a foldout plan of the garden, there is an alphabetical list of plants growing there, followed by a series of empty, numbered lists, arranged under the headings of the garden’s four quarters, for the students of the time to locate the plants in the garden and enter their names in the right place on the lists. A wonderfully simple way to encourage close observation and the process of identification. 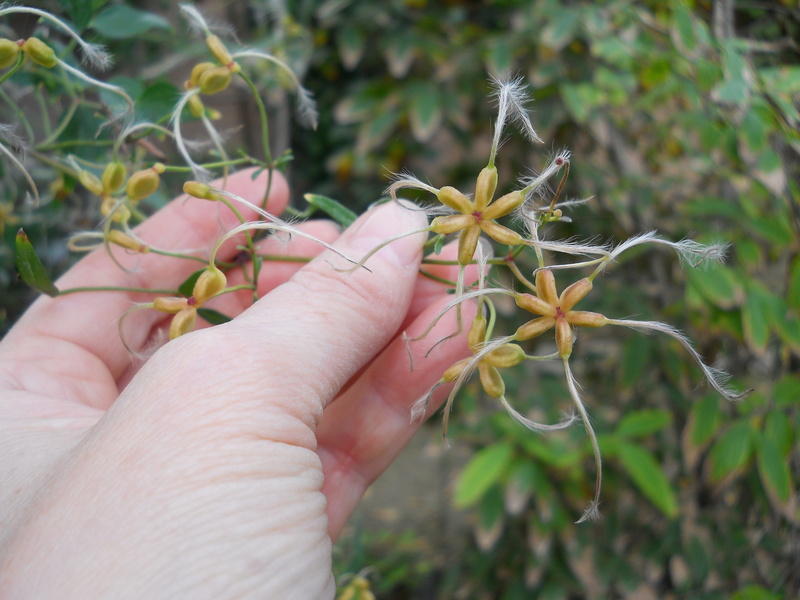 What we don’t know, this being pre-Linnaeus, is what many of the plants listed actually are. Venus’s belly-buttons? Light hearts? Bearded priests? This morning there are gardeners where yesterday afternoon, there were none. They are planting and pruning, raking and barrowing – purposeful but relaxed. I’ve come to sit by the statues of Solomon and the Four Seasons – intrigued by the way they’re placed just outside the circle and although set at some distance from each other, seem to look at each other: Busts of Spring and Summer (female) and Autumn and Winter (male). Solomon in the middle, holding a book and looking up to the heavens, as if for inspiration. Spring is a young woman with flowers in her hair. Summer is older, plumper. Both women bare one breast, their left – but still manage to look serene, elegant, draped in carved folds of cloth, jewels in their ears, round their necks. They are set against a tall, curved hedge of clipped bay, glossy with last night’s rain, sweet and aromatic pressed between my fingers. 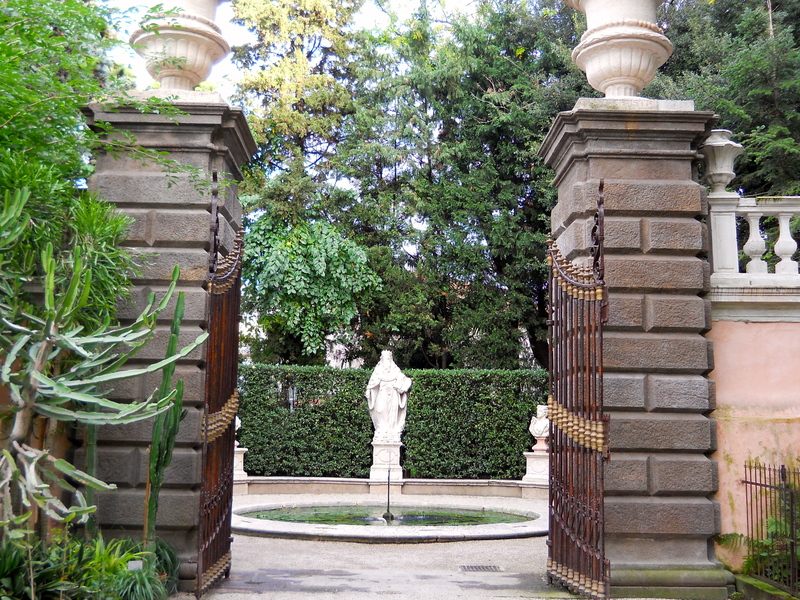 I can hear the fountain trickling into its pool of water, contained within a circle of stone bracketed with metal bars. The green surface of the water is almost covered with lily pads, a different green, submerged at the centre, lightening and rising towards the circumference. And then the gardener, patiently raking leaves from the gravel paths. To the right of Spring, there is a weeping white mulberry (Morus alba pendula). Standing inside it, you are held in a circle of green light. At her feet (if she had any) a small box tree with fresh new growth at its tips, trimmed into a small sphere. 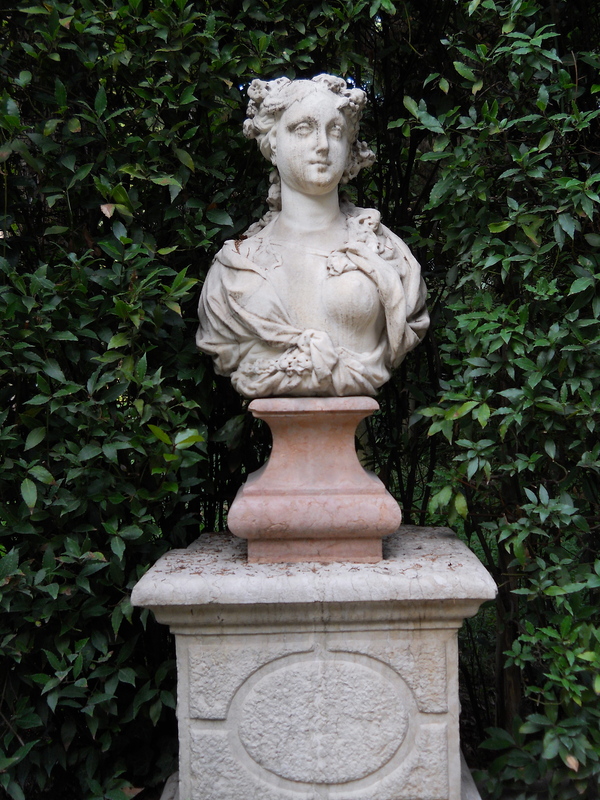 Instead of feet, Spring has a cream-coloured pedestal topped with another, smaller, carved from pink stone. 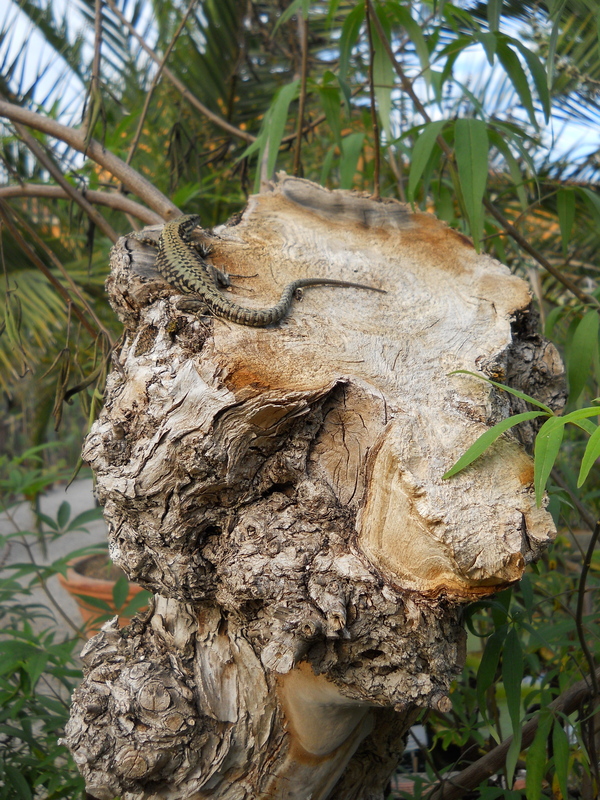 She is marble, streaked with black dust from the cones of the Cupressus arizonica above her head. She is less pretty close-up, slightly worn and no jewels as I’d thought earlier. I prefer the maturity of Summer, on the brink of ripeness. Her marble’s streaked with soft grey veins and she has a dimple in her chin that makes her look more human, less of an ideal. She is looking at Winter (her seasonal dance partner? 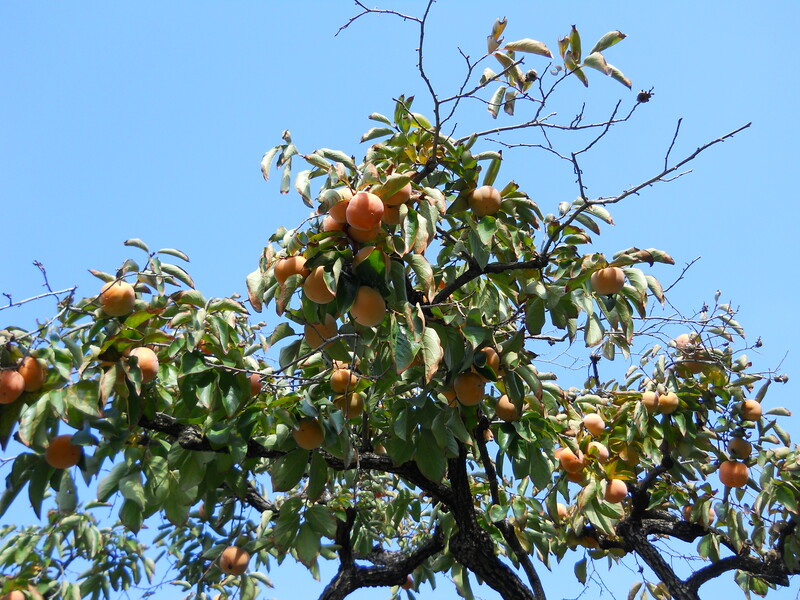 ), an old man draped in furs with what look like winter fruits in his hair, maybe gourds or cones? He has a tight mouth, thin lips, as if he’s lost his teeth, but is still noble with his strong nose and luxuriant beard. Autumn clearly fancies Spring. 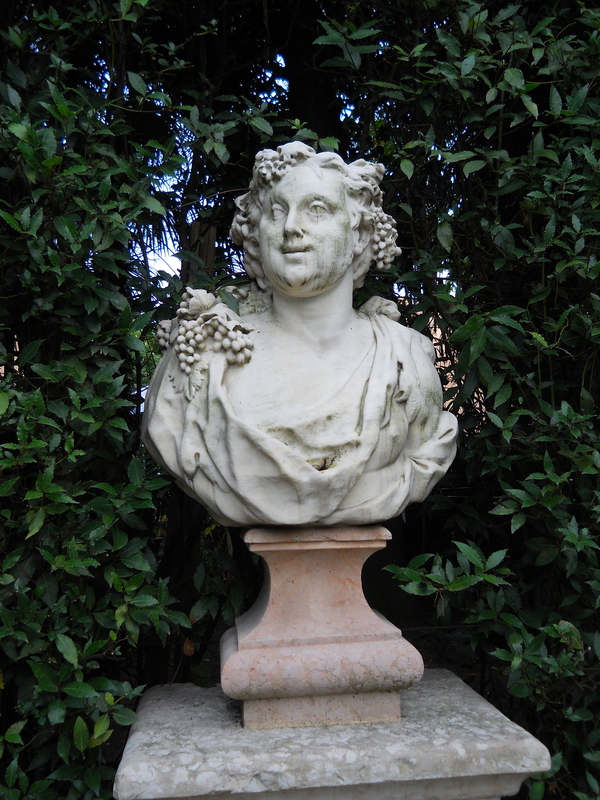 He has a touch of middle-age spread, a bon viveur, grapes and dates in his hair, a fleshy mouth and laughing eyes. But there are bags under them, hinting at a vulnerability beneath his carpe diem attitude, knowing Winter’s not far behind. Each season doesn’t look at the one next to them – perhaps too redolent of their own demise, preferring the symmetry of the Other, their polar opposite by which they might measure and balance themselves. And then in the middle of the group, Solomon, making some sort of judgement with his book and what was once a sword. Choosing between seasons? Between male and female? Between youth and age? An impossible decision. The circle of the pond in front acts as a sort of answer – unintended or not – a Zen-like taste of union and openness, continuity and change. On the eve of my departure for Padua I took the few renga lilies that have survived the depredations of some leaf-cutting insect lurking in my conservatory to Moorbank. It seemed important to leave them in safe hands, where they’d be sure of a stable environment and regular temperature. I’d always imagined that they’d end up there, an exciting addition (New Zealand native) to the collection under glass. They had been doing well despite setbacks – greenfly and windburn – which I was pleased I’d been able to overcome. I wasn’t sure what Clive, the manager, meant when he said he would look after them for just one year. I was shocked when he explained that the University had made the decision to close Moorbank and it might not be there beyond a year’s time. I was dumbfounded – sad and cross – not sure what to say or do for the best. It was a strange, disorientating piece of information to take with me on my first visit – to the world’s first botanic garden, established in 1545. The superimposition was disturbing – here I was finally embarking on my ‘Grand Tour’ of Botanical Gardens, for which Moorbank had been the seed and inspiration. Ironic that it was there I discovered how important botanic gardens are for our future in terms of research, conservation and education and now its own future had been curtailed by what it’s hard not to see as a short-sighted management decision, yet another disastrous ‘austerity’ measure. I am still in the process of assimilating this news and will no doubt be returning to the subject, as will various others who are keen to find some way to keep Moorbank going. Padua felt like a different world all together – running to a kinder calendar, clock and thermometer. 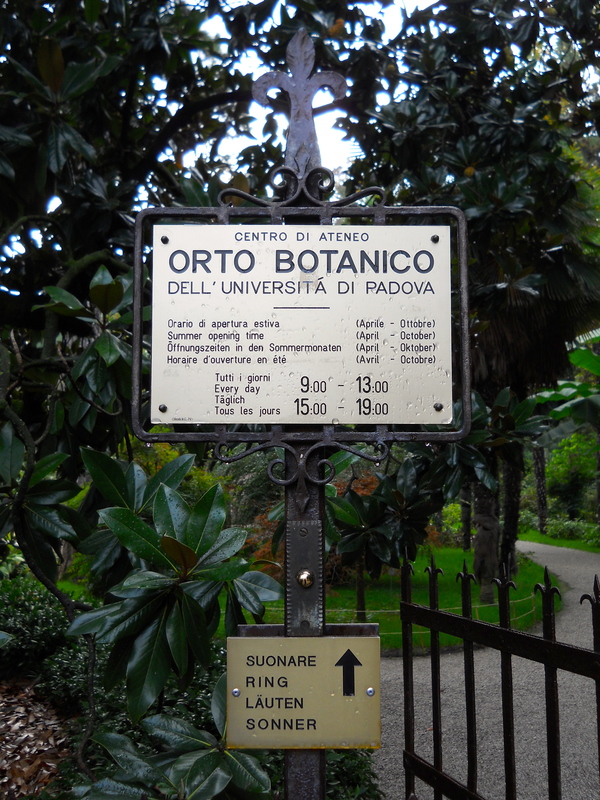 In the privileged, cosseted position of ‘visitor’, and with the luxury of just one task to focus on, it was easy to feel at home in its daily rhythms, marked by the chiming of the bells at St. Anthony’s Basilica, set at the end of the cobbled street that leads down to the Orto Botanico. Entering the garden felt momentous, almost ritualistic – so many stations of the cross to pass through on the way – two bridges over shallow waterways grazed by sleepy, semi-transparent fish, two sets of gates, stone pillars, wrought iron, an assortment of signs, a ticket booth (where the attendant sat listening to the Beatles on my first encounter!). Then, even inside the garden, there is another wall to pass through – tall, circular, red brick – built in 1552 to keep out the thieves who’d taken to stealing the precious plants collected from the Venetian Republic’s trading posts in the Horto Medicinale. 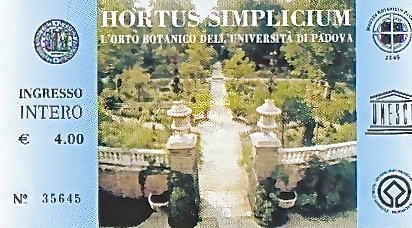 The whole layout – a typical Renaissance design: a square, divided into quarters, contained within a circle, forming a hortus sphaericus or cinctus – invites a similar response: a conscious, embodied relationship with ‘Nature’, based on the enlightened understanding that the human is part of it – inside and out – and accords to the same principles as everything in the wider universe. Walking round the garden was an incredibly rich experience – metaphysical, sensual, aesthetic, horticultural, scientific and ecological. There were an infinite variety of possible routes to take, the structure wonderfully apparent at the end of the season, with many plants at a less lush part of their cycle. However it was clear right from the start that something very different was going on here from what would be possible in the North East of England. Two lemon trees flanked the inner entrance at the West Gate. 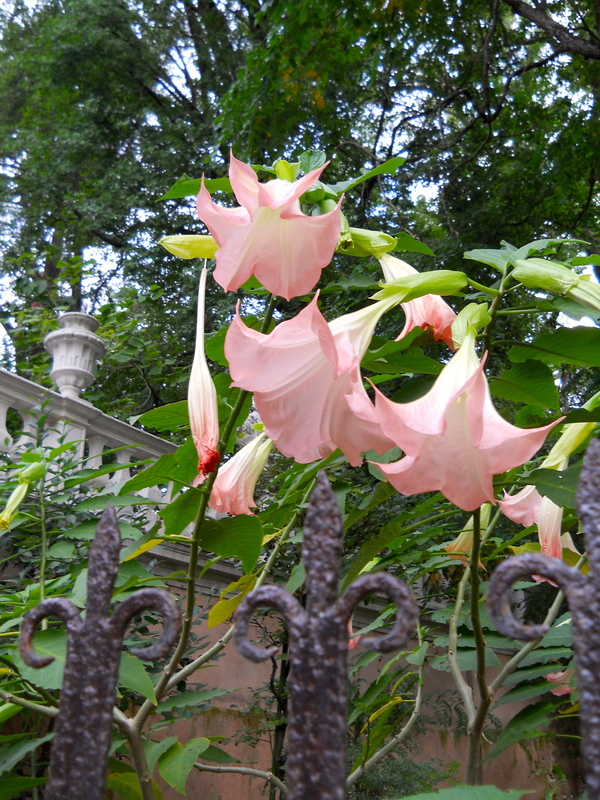 Exotic Brugmansia grew abundantly in huge terracotta pots. Cacti and succulents and palms I’ve only ever seen growing under glass at Moorbank stood outside in the open air. An artesian well allows the garden to be fed and watered by a thermal spring which makes all this work, as well as counteracting the long, parched Italian summers. While I was there the temperature was falling (still around 20 degrees C most days, but cooler at night) and some of the tender plants in pots were starting to be moved into the shelter of the old 18th century greenhouses. 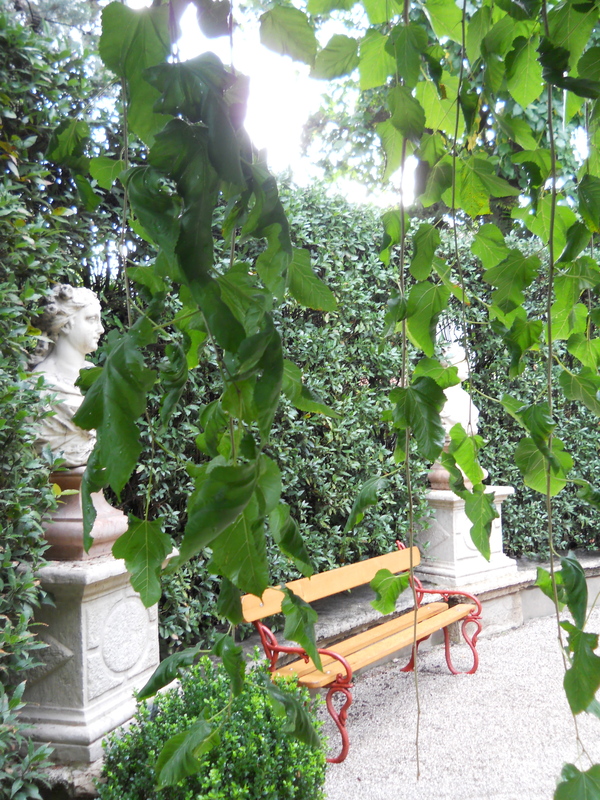 One of the special attractions for me of the garden in Padua (apart from its place in history and very particular layout) was what is known as ‘Goethe’s palm’. There was a sense of pilgrimage in seeking it out, following in the poet’s footsteps. I’ve been reading his 1790 book The Metamorphosis of Plants, fascinated by his careful observations, recording of detail and probing for botanical and philosophical significance. 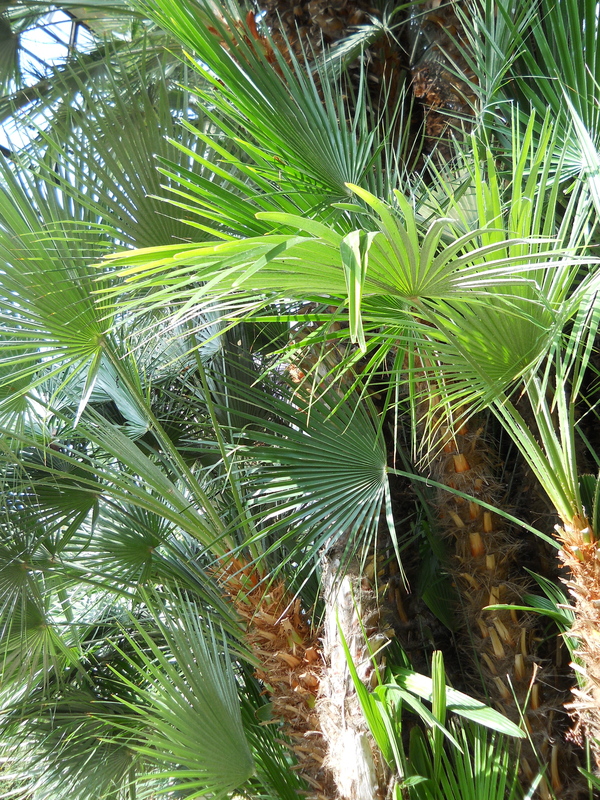 Goethe visited the garden in Padua on his travels to Italy and refers to this particular palm – a Mediterranean fan (Chamaerops humilis) – in his book, as an example of the successive differentiation in the formation of the leaves. 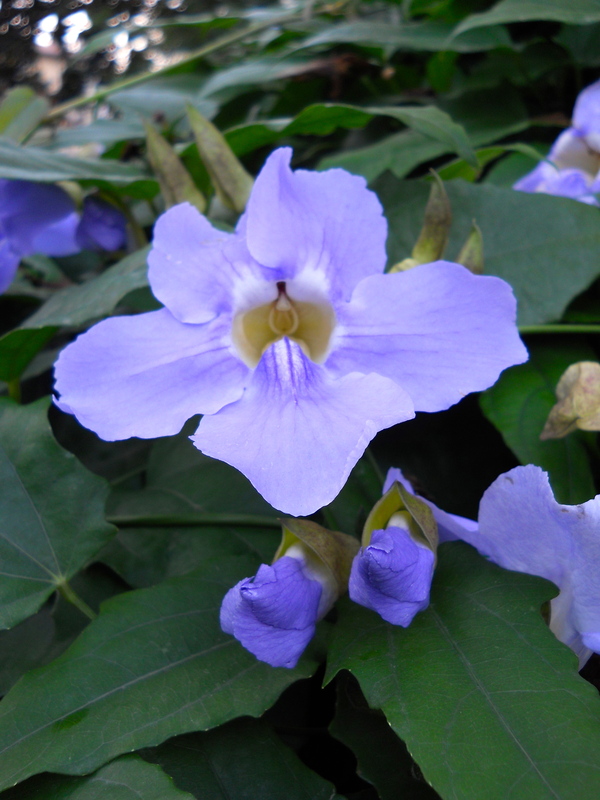 It has its own octagonal greenhouse, built between the wars, which it is now outgrowing. There is an old sundial, a hollow circle carved in stone, just outside. Its lines and shadows mirror the form of the palms’ leaves in a manner recalling the Renaissance system of ‘correspondences’ – As it is above, so it is below. This echo effect spills all over the garden and the effect is of a precious, faceted jewel – profoundly pleasing, stimulating and inspirational. I spent a delightful morning with the Vice-Prefect, Antonella Moila, and she was able to point out various aspects of the garden I might otherwise have missed. I was especially interested to broach the big green barriers on the south of the garden to take a look at the new development. 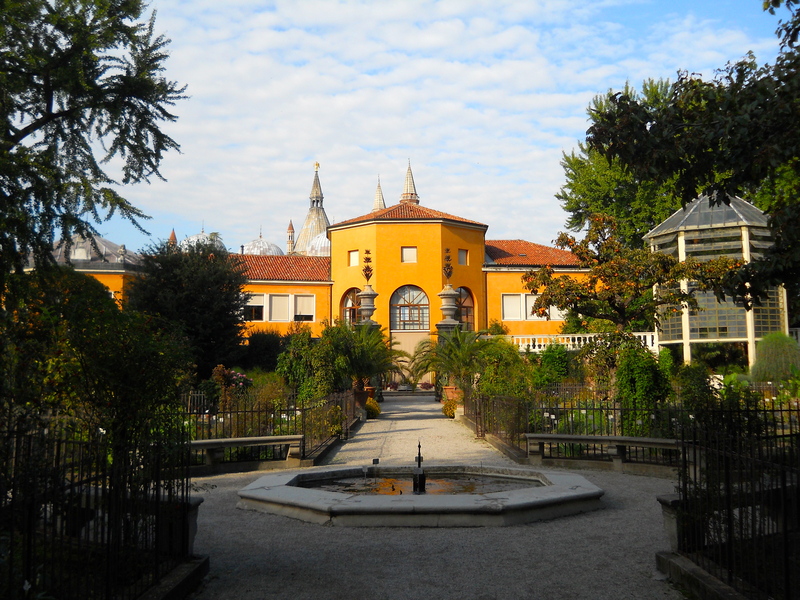 Enormous, confident glasshouses rose from a parcel of land bought by the University of Padua from the Jesuit Church. They were just installing the sun shades the day I was there. This whole extension, fringed by the Romanesque domes of the Basilica of Santa Guistina, is still in the process of being landscaped so there is lots of mud and machinery and no plants just yet. But despite delays (the original plans were agreed around 10 years ago), it is hoped the new addition will be open to welcome many more visitors to the garden next spring. Grafting new onto old, this garden’s history is still in the making. It made me even sadder about Moorbank being closed – seeing the investment the University of Padua is making in the future of this garden, taking on the demands of change, without forsaking continuity. At a time of economic crisis, it requires a leap of faith – something perhaps Italians manage more naturally than us. 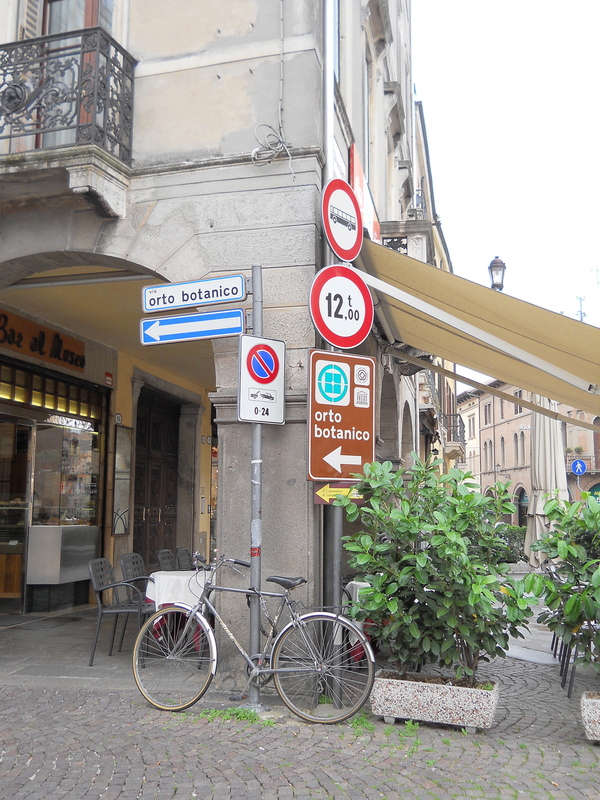 I could say much more about my week in Padua – and probably will – but I wanted to share some initial impressions for now, as I unpack. Just before going I decided to leave all my ‘technology’ at home and stick with notebook, pencil and camera. It was the right decision, I think, allowing an undiluted immersion in the place so that now I have my own deep well to call upon when I come to write about it. I’m sure I’ll also be talking more about my visit to this enchanting and important garden at my reading at Durham Book Festival on Sunday 29th October (in the Town Hall at 3.30pm). I look forward to seeing some of you there.